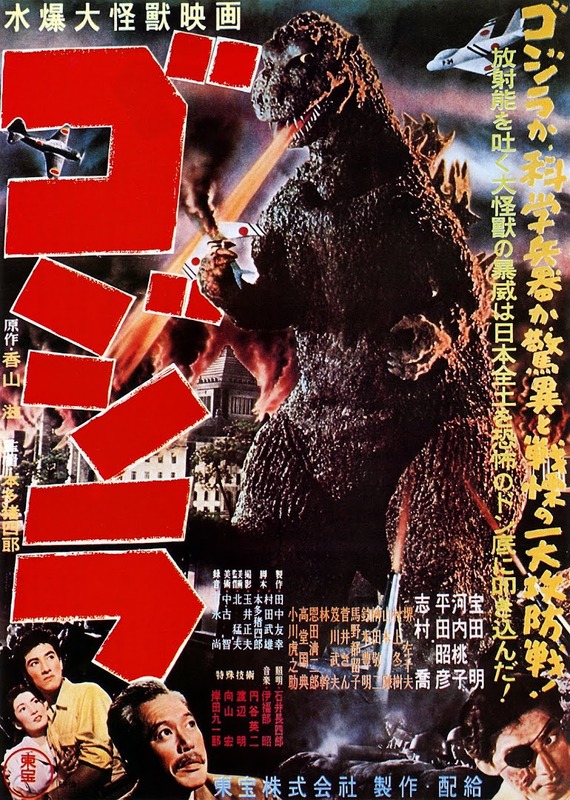 In October 1941, RKO released a fantasy film that blended supernatural chills and light-heartedness with a classic Faustian bargain and even political discourse into the mix. Ultimately it was known as The Devil and Daniel Webster but initially came out as All That Money Can Buy, a fitting enough title referred to in an important line of the movie’s dialogue. It had to be changed though to avoid confusion with another film of theirs in the same year called The Devil and Miss Jones. The origin of the tale began with Washington Irving’s 1924 short story The Devil and Tom Walker in which the titular impoverished New Hampshire farmer of 1840 is tempted to sells his soul in return for a chest of treasure on his land, booty left there by pirate Captain Kidd. Whilst he mulls it over, his evil wife fatally seals the deal in his absence which he then agrees to continue. In the guise of Old Scratch, the Devil finally claims his due and carts away Walker on a black horse amid lightning strikes. Stephen Vincent Benét adapted the story in 1936, this time making the contract a secret solely entered into by farmer Jabez Stone and adding a legal trial in which he enlists the aid of the renowned, real-life legal eagle Daniel Webster who is deceived somewhat by ‘Mr’ Scratch loading the jury with cut-throat pirates and traitors including Captain Kidd. Despite the cunning ploy, the jury finds for the defendant. Stone is freed, leaving an interesting epilogue whereby Scratch reads Webster’s future and accurately predicts his failed run for the Presidency, his sons’ deaths and accusations of traitorship for supporting the Compromise of 1850 whose bills may have staved off the Civil War till the 1860s. Scratch reluctantly concedes that the Union will win the war, thus earning a celebratory seeing-off by being kicked in the pants outside by Webster. 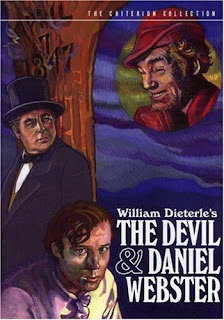 The plot and irreverence toward the Devil from this version became the blueprint for the 1941 film adapted by Benét and Dan Totheroh along with implied anti-slavery sentiment. 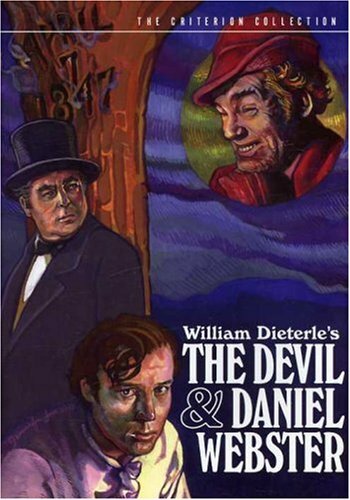 Production and direction were both handled by William Dieterle whose esteemed pedigree had already garnered him the Oscar for Best Picture for The Life of Emile Zola in 1937 and the never-bettered Charles Laughton version of The Hunchback of Notre Dame (1939). The film starts with a prologue on screen that invites us all to consider that as the everyman fantasy fable unfolds “Yes, it could even happen to you”. James Craig makes a solidly convincing portrayal of Jabez Stone whose epic character arc encompasses the descent from ploughing a hard furrow as a good, God-fearing farmer into a rude, swaggering tyrant lording his unearned fortune over his fellow townsfolk. His performance lifted him out of the B-movie ranks into better work. He is well-supported by Anne Shirley as his loyal, suffering wife Mary (four years after her Oscar for 1937’s Stella Dallas) and the ideal mother of homespun wisdom in Jane Darwell soon after winning her own Oscar as Ma Joad in The Grapes of Wrath (1939). The most memorable performances in the film though are the two shortest notables in screen time but nonetheless indelible. As Scratch, Walter Huston is a stand-out. Head of the illustrious Huston acting dynasty (father to director John Huston and grand-father of actors Danny and Angelica), he gives a dazzlingly mischievous turn as the Devil himself and would later join his other two statuette winners in the cast after winning as Best Supporting Actor in The Treasure of the Sierra Madre (1948). He suddenly arrives in Stone’s barn back-lit superbly by Joseph H. August’s cinematography after Stone offers to sell his soul reflexively in bemoaning his bad luck – a terrific staging of such a key scene. Under his Robin Hood cap Scratch eternally beams the wide Cheshire Cat grin of the smug, charming salesman who knows he has the power to give everyone exactly what their desperate hearts desire. His smile almost never leaves his face for he knows that in return for a simple signature, as with Stone in return for seven prosperous years, each person forgets all consequences in their blind greed. Scratch pops up like an impish sprite repeatedly to survey his charges, ever-watchful for new customers as well. Intriguingly, one who never falls to the demon of temptation is the other powerhouse and conscience of the movie: Daniel Webster played with great dignity and command by renowned portrayer of authority figures Edward Arnold. He perfectly embodies the calm centre of the story, a fundamental decency and trust in humanity no matter how lost we (as Stone) may temporarily be. Arnold’s bearing is every inch that of a man utterly unshakeable in his faith, his voice deep and measured, one that is used to being heard as it persuasively argues his case. He also graces with distinction many of the script’s best lines – worthy of mention for their period flavour, such as when hearing of Stone’s inflated grandeur: “He’s certainly made himself the big frond in the little puddle around here”. Webster is powerfully introduced in the fevered heat of speech-writing while a strikingly-rendered shadow (guess who) crouches at his side whispering seductively to no avail. For the most part, the tale focuses on the tortuous downward trajectory of Stone as he grows lazy and cruel under the false comfort of his ill-gotten gain. His wife and mother can do nothing but look on as he alienates all around him, dishonours his previously-cherished Sabbath in card-playing and ignoring the gratitude of observing Grace at the dinner table. As his capitalist wealth expands, he upgrades his home to a huge mansion while degrading his humanity, along the way gaining a mysterious femme fatale maid Belle (literally so in the death-attracting form of beguiling French siren Simone Simon). Together they are reminiscent of Rhett and Scarlett from Gone with the Wind, wickedly compatible yet heading for ruin, accelerated by her as planted in his life by Scratch. Stone’s disintegration lives up to his surname by even laughing at his neighbours’ crops destroyed by a freak harvest hailstorm while his fields remain supernaturally intact. Proof of what ghastly harm Belle is tolling for at his side comes at a ball when the only guests who will attend him are a spectral gathering of souls. In among them is at least Miser Stephens (John Qualen, showing his character actor as also seen in His Girl Friday and Casablanca) yet he almost doesn’t count since we know he has sold himself for the same Haitian gold coins as Stone. Another stunning sequence of effects work rendered by Vernon L. Walker under August’s soft-focus sees the ghostly carousers party until the she-devil turns the mood into a dance of death for the loan-shark. becomes vital. Stone is reduced to his son being demanded by the Devil as the only way to avoid his now-expired contract leading to Stone’s due death as payment. “I promised you all that money could buy,” gleams Scratch in triumph. “I don’t recall any other obligations”. And so Dieterle’s direction builds beautifully to a staged trial in the last fifteen minutes with Webster to the hoped-for rescue of the conscience-returned farmer. Webster asks the grinning Scratch for “An American judge and an American jury”. Befitting his nature the Devil obeys the terms, but evilly stacks the deck with a phosphorescently glowing bunch of choice criminal scumbags from history marching up from under the stable floor. These include the aforementioned Captain Kidd, Edward Teach and the disgraced General Benedict Arnold. Once again, the director creates effective frissons of the eerily hypnotic without needing to plunge into full-blooded horror. The stage is set for a bravura defence by the beetle-browed Webster that surely must rank as the ultimate test of any lawyer’s oratorical fire since he will be doomed like Stone should his speech end in a guilty verdict. This is also where the film plays its subtlest card, that of weaving in the timely theme of (pre-Civil War) Abolitionism, paralleling the freedom sought for Stone with that of the black victims of enslavement across the nation. It is implied in Webster’s impassioned statement rather than overtly stated, yet the imagery is unmistakeably targeted: “And when the whips of the oppressors are broken and their names forgotten and destroyed – free man will be talking and walking under a free star.” With an emotional thrust enough to make Lincoln throw up his stovepipe hat in admiration, the great man concludes. We see the ‘Jury of the Damned’ confer and then with wordless impact, the Foreman slowly tears up the now-unenforceable contract. Stone is free. As for his African-American brothers and sisters, their day will not come so easily; only after the most hideously scarring of wars has wounded the soul of every family in the country. 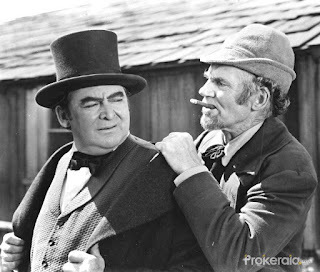 The Devil and Daniel Webster is a moving and sincere morality tale, all the more so for being couched to some extent within fantasy trappings. The Academy Award-winning score by Bernard Herrmann combines stirring themes with atmospheric spookiness and comedic fancifulness to sweeten the more sombre predicaments played out. Speaking of endings, there is a lovely coda courtesy of Huston. After conceding his loss like a sportsman, meriting a boot to the backside just like in Benét’s version, he scoffs a peach pie stolen from Ma Stone and then prepares to go about his business. Out comes his little black book and as his eyes roam the horizon for more suckers to bring to account, with wicked glee they alight on…us. His finger points to the audience and deliciously breaks the fourth wall, a perfectly pitched way to send us out from this gem in a spirit of playful caution.